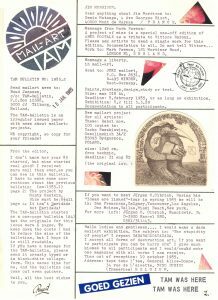 TAM-Bulletin – iuoma.org – Interested in Mail-Art? 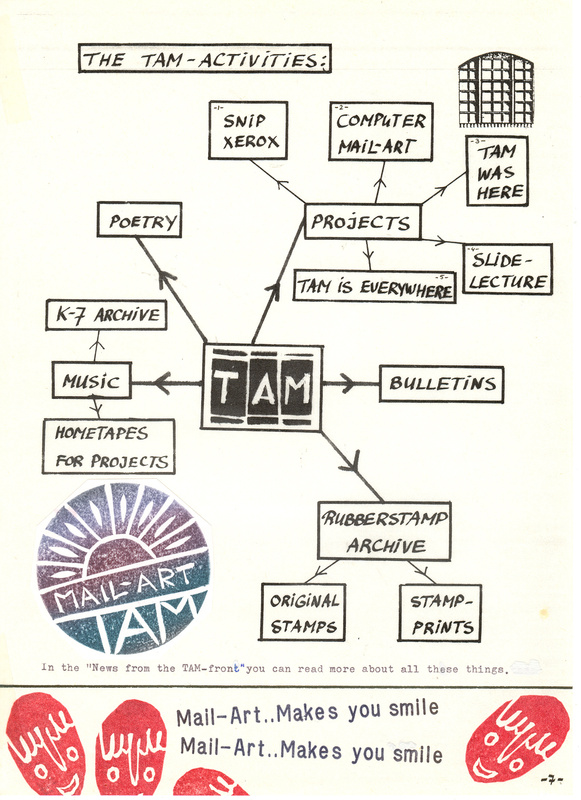 The TAM bulletin was issued in the 80-ies. 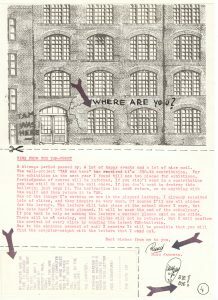 Originals were made with the typewriter and then xeroxed with a machine and sent through the snail-mail. 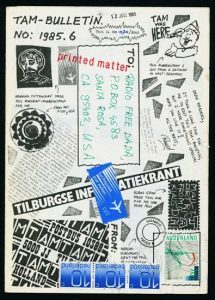 The Mail-Art network funtioned differet in those years and the papers connected thousands of people back in those 80-ies. 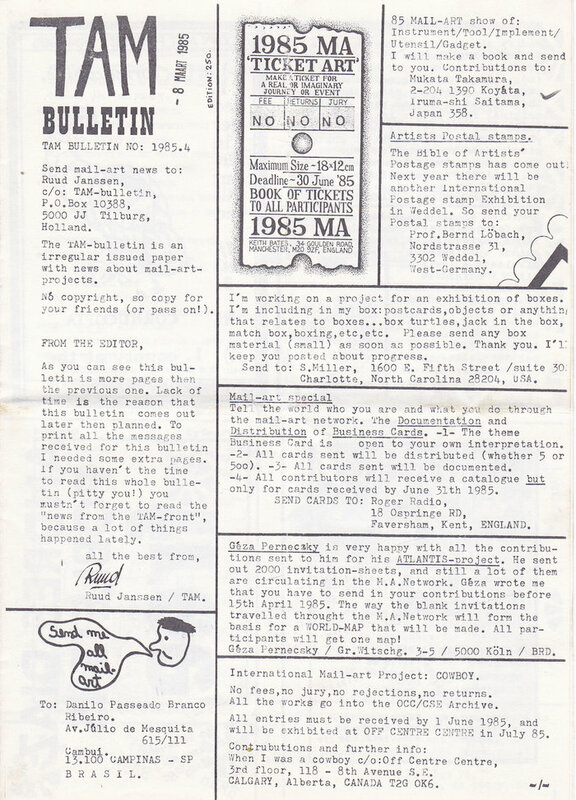 When Crackerjack Kid (Chuck Welch) from USA asked me for some more copies of older TAM-Bulletins for his archive, I decided to undertake an even larger task. 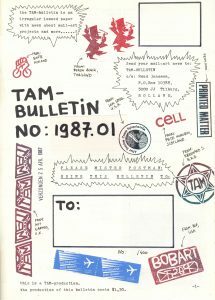 I started with going through my own archive to select all the information about the TAM- Bulletins that I could find and make a complete book out of it. 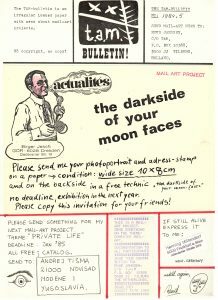 This work started beginning 1995, but because of the mail- interview project things got postponed again. 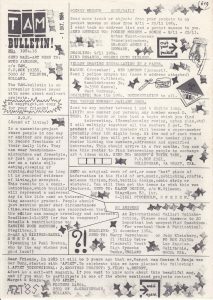 Now in the Summer-vacation of 1996 I finally succeded in finishing the publication. 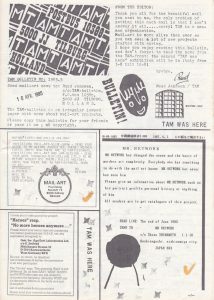 In the last year no new TAM-Bulletin was published. 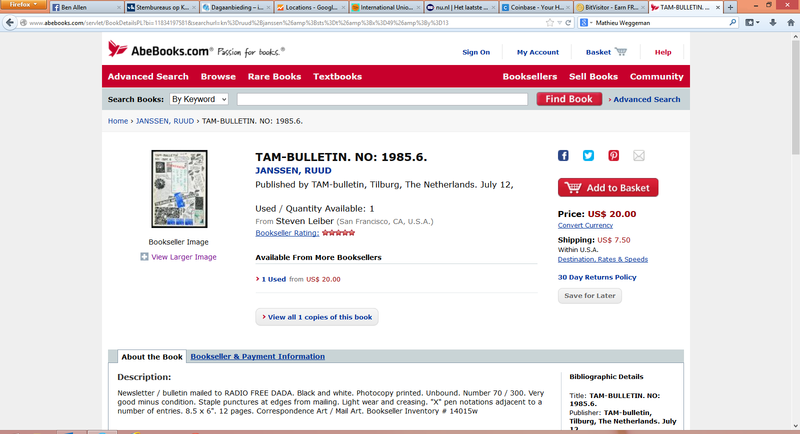 Already others have started simular publications, and there is no need to do things double. 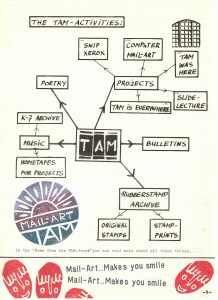 The TAM-Bulletin has appeared in many forms, and with the history of over 12 years it sure is a well- known name. 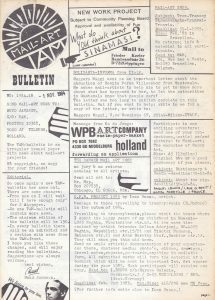 Because of the limited edition most TAM-Bulletins are published, not many have seen the complete development of the newsmagazine. This book hopefully will change that. The beginning. 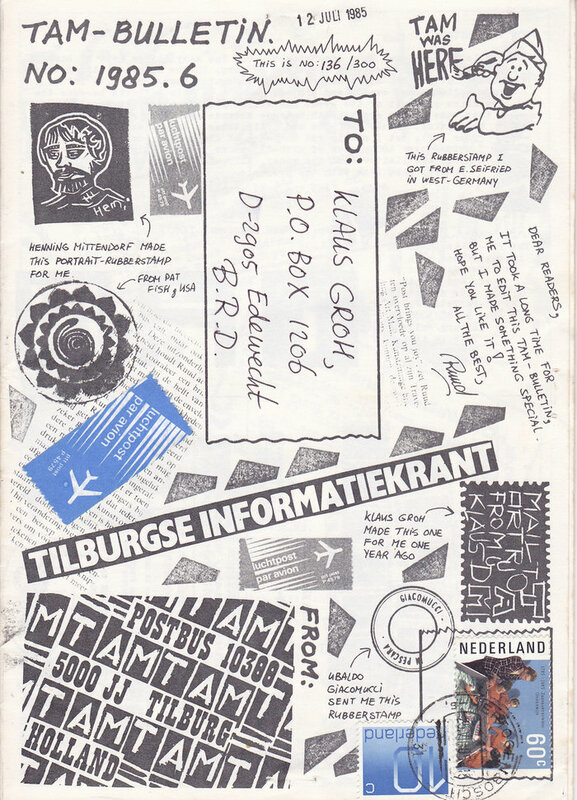 With the growing number of contacts within this network I received a lot of information about other Mail- Art projects. 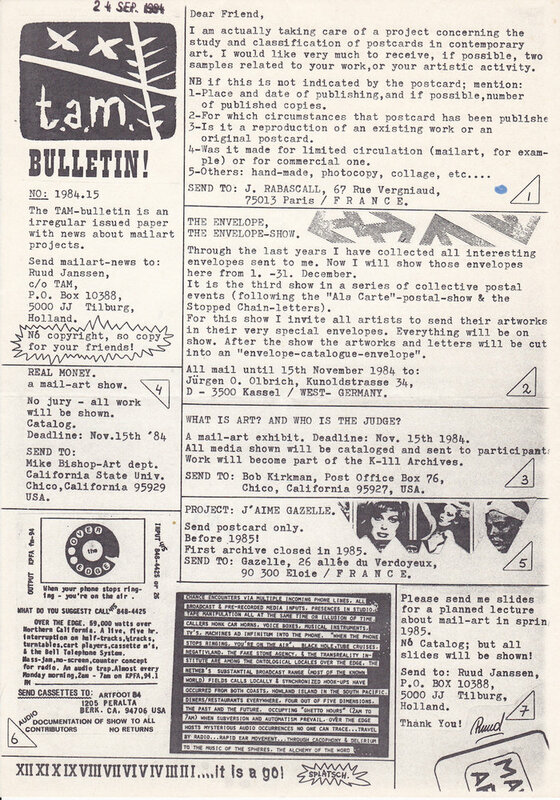 At a certain moment I decided to make a bulletin with all the info’s on it. This was because a lot of people out in the network asked about information. 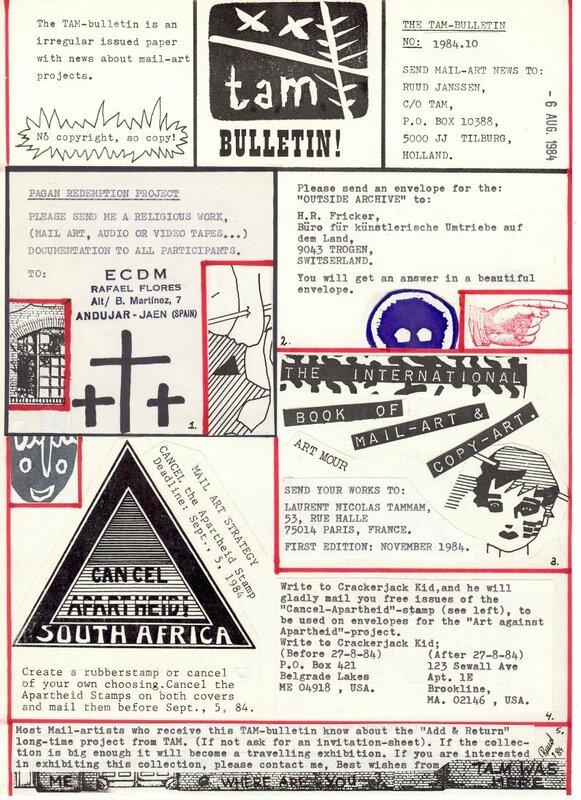 The first bulletin was numbered 1984.5 . 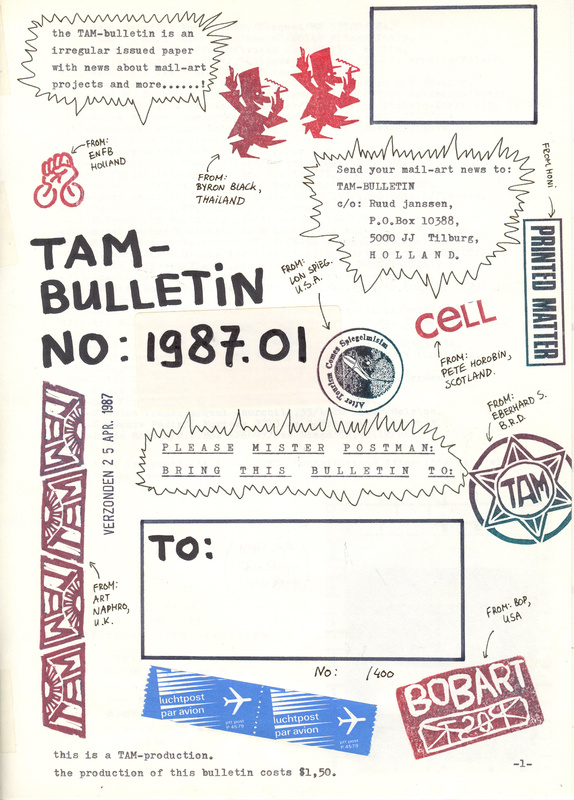 So in May 1985 this first TAM-bulletin was born. How it grew. 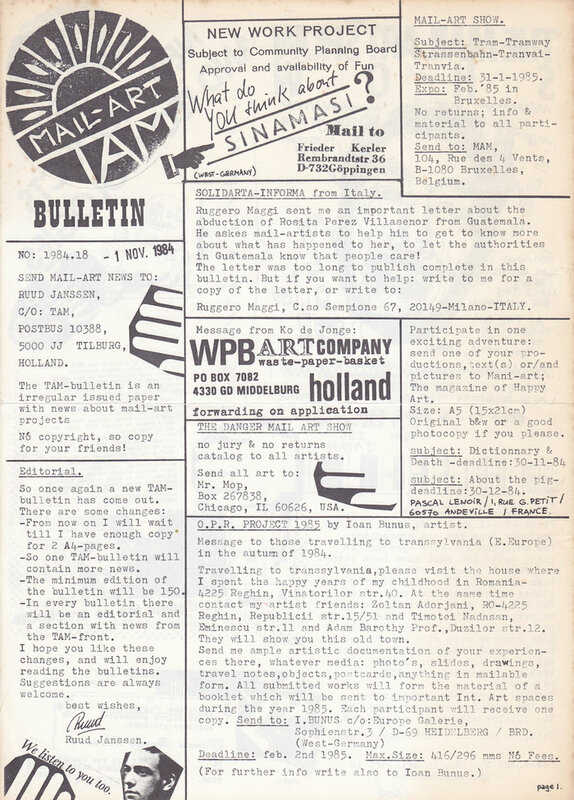 The first TAM-bulletins were only one page and had a circulation of about 40. Since the number of contact I had in the network these amounts became bigger and bigger. 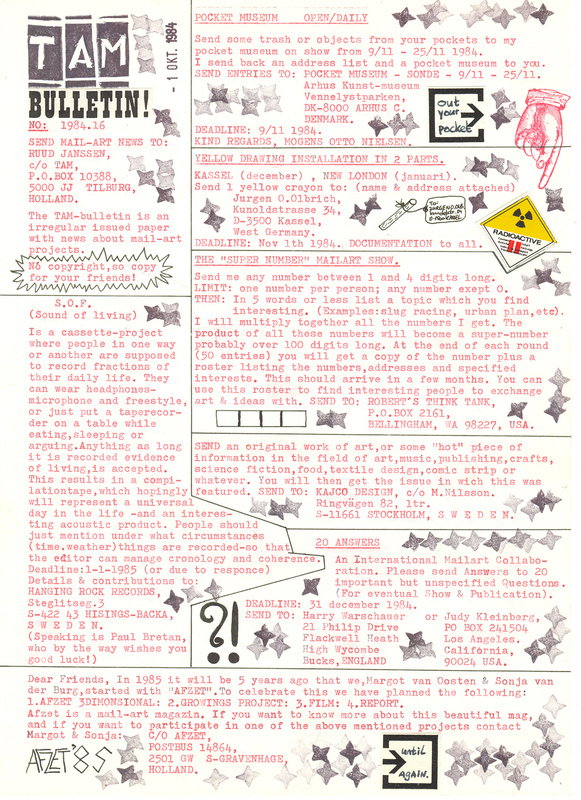 The later issues came up to 14 pages and the biggest circulation of 400 copies. There were special sections in the bulletin with ‘News from the TAM-front’ and sometimes I used the bulletin to document my projects. 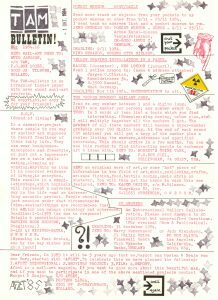 In the period that I issued the ‘paper’ TAM-bulletins I sent out about 3.300 of those bulletins. 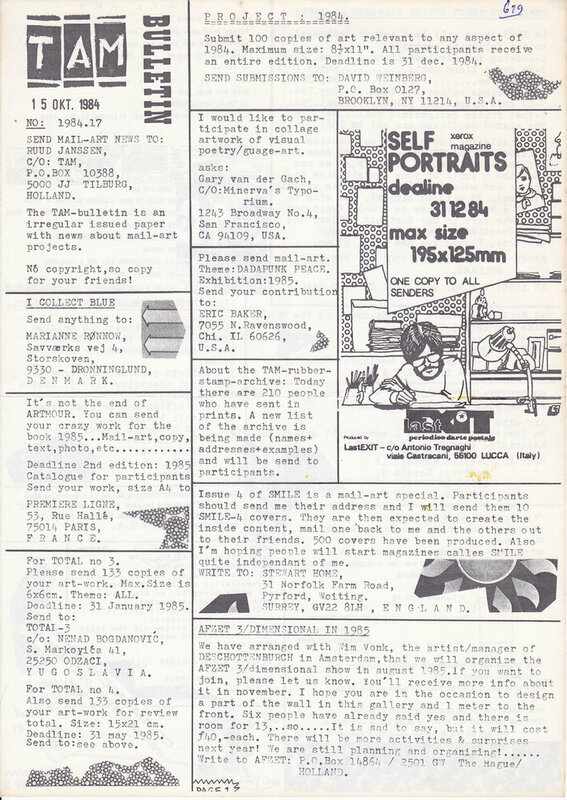 There were 27 different editions. 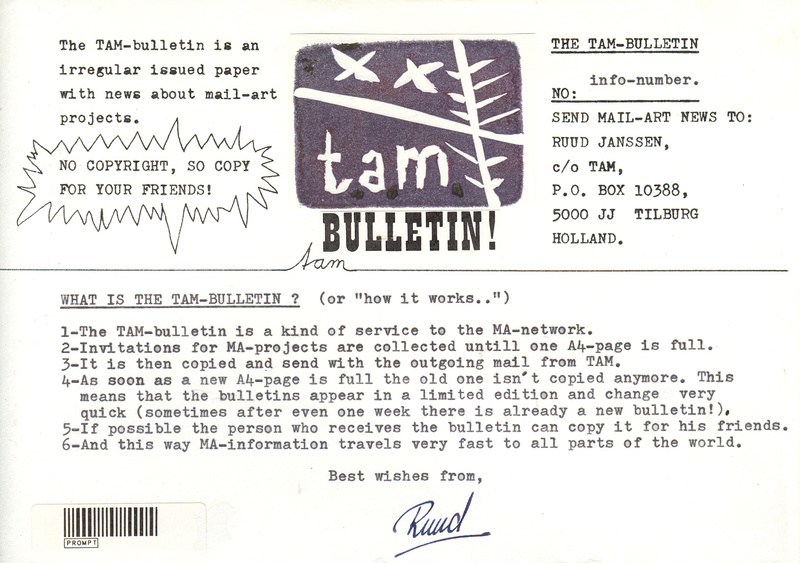 In 1986 and 1987 only one TAM- bulletin was put out. 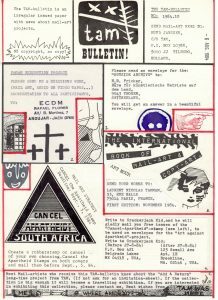 This was because I started with a computerized version of this bulletin. 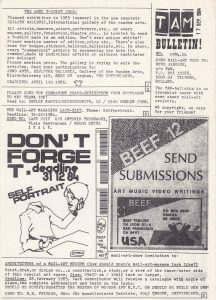 In 1987 the bulletin really got computerized. More about that will come later. Messages. 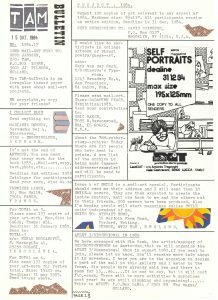 In the years 1986 and up I started experimenting with using the computer. In order to keep spreading the mail- art information I decided to make small mail-art messages which other mail-artists could spread around and even could use for their own magazines. About 120 different messages were sent out. 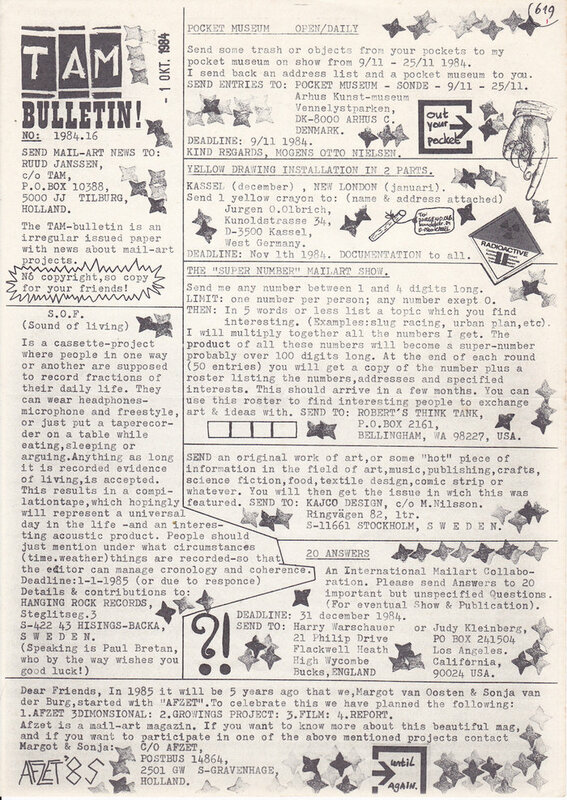 The edition was mostly about 40. 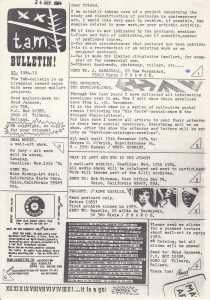 In the beginning of 1989 I stopped with these messages because I got the bulletin on- line (see more about this in chapter 8). 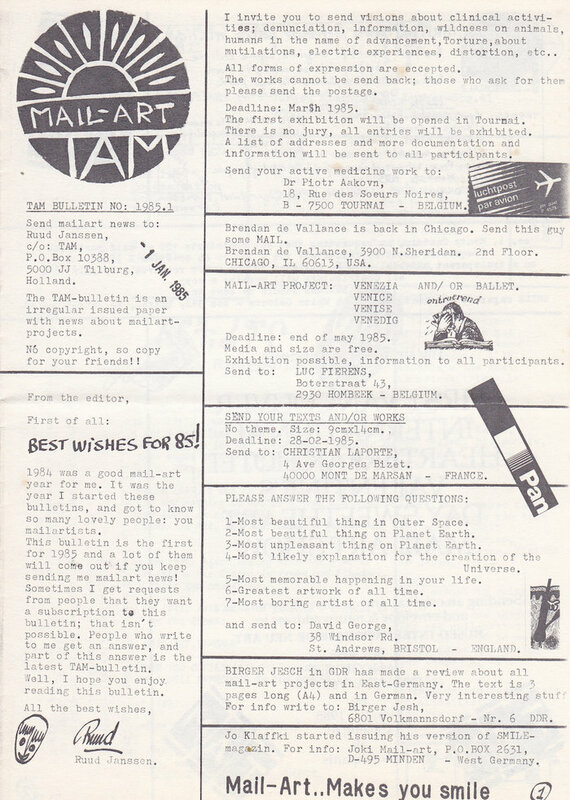 In the beginning of 1990 I also send out messages about mail-art projects in a ‘TELEX’-form. 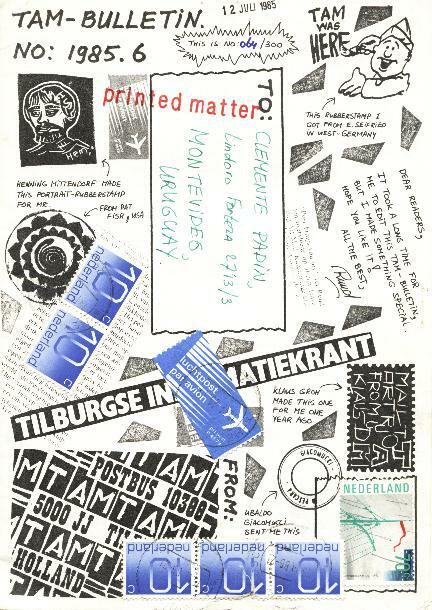 These mail-art projects were mostly from beginning mail-artists who didn’t have that many contacts around the world.The main reason for still making copies of mail-art invitations is to make the network accessible for everyone. 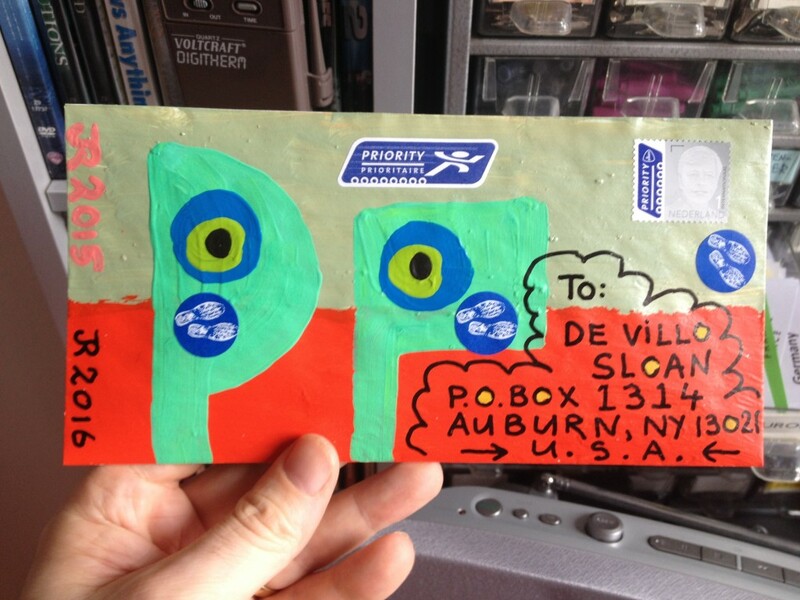 Whoever wants so sent out creative mail must be stimulated. 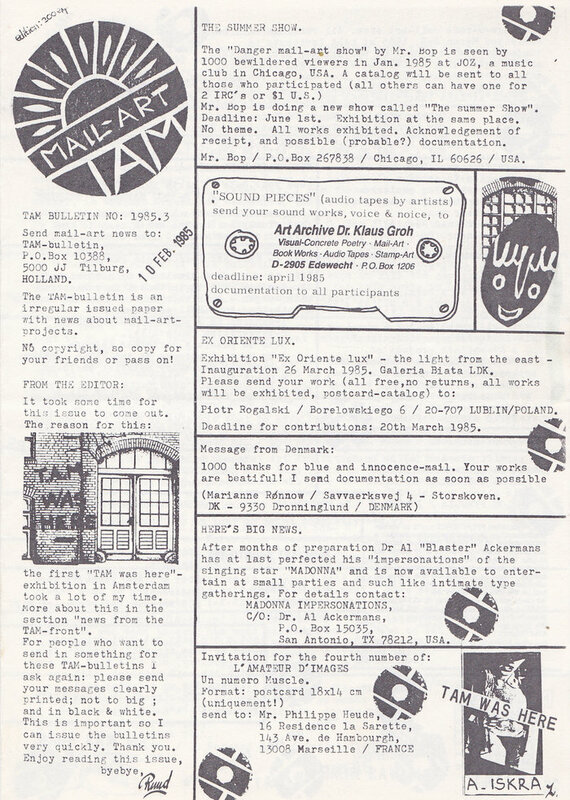 Everybody who wants to can be a mail-artists. 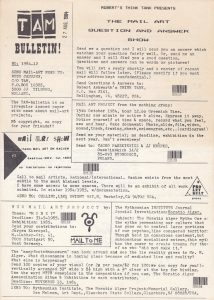 The computerized TAM-bulletin.After experimenting with datacommunication I decided to make the TAM-bulletin a computerized bulletin. 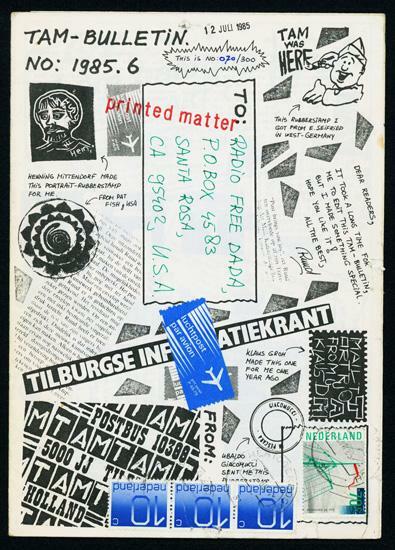 The information should be accessible for all other mail-artists which had access to a computer. 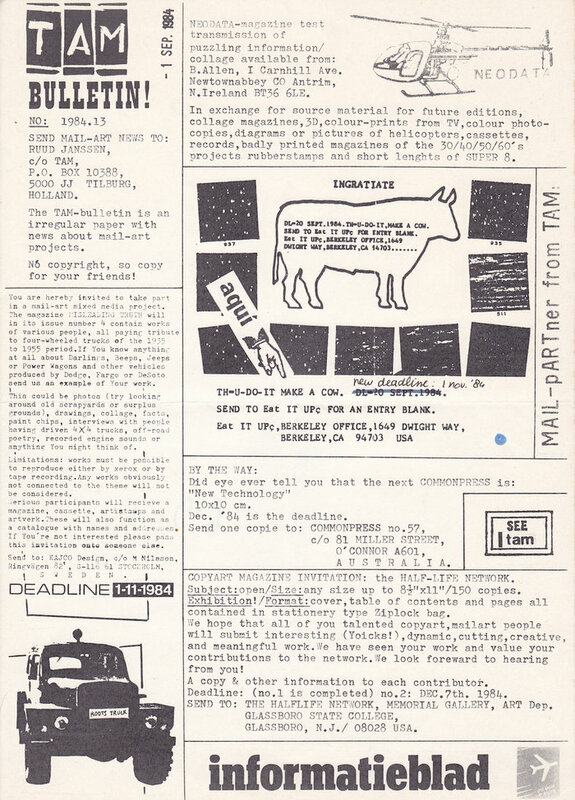 The computerized TAM-Bulletin is -at the moment- still no great success , but in the future when datacommunication will become as normal as sending a letter , these kind of bulletins (on- line information) will become the new forms of communication. 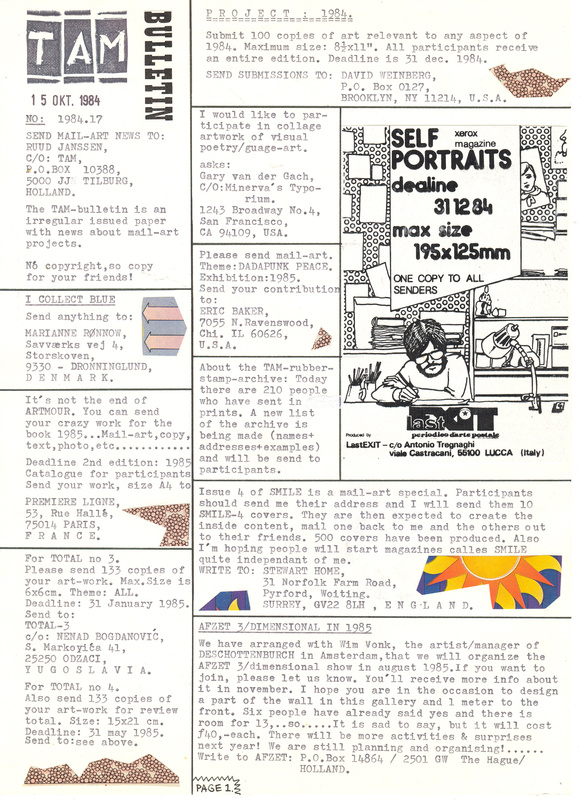 Now it is still experimental when you look at the art-world (for the computer-world these kind of bulletins are nowadays widely used.If you yourself want to experiment , just let me know. Also details about settings and phone-numbers are available for those of you who are interested. 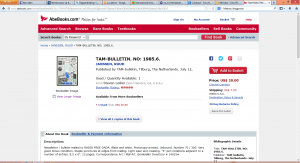 The TAM-bulletins are now accessible 24 hours a day! (you only have to make an appointment with my computer…!). 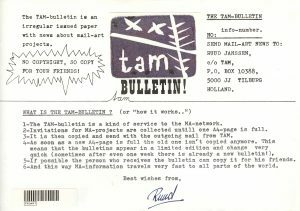 For making the acces to the bulletin possible for other computerusers I sometimes upload a TAM-Bulletin to another BBS, so there it might be accesible too. 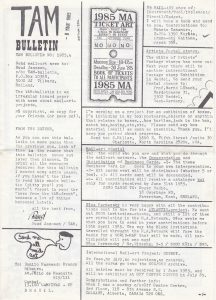 The list of BBS’s changes so rapidly that it is no use to mention which BBS’s have the current issue of the TAM-Bulletin. 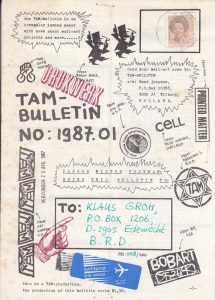 Some names of BBS’s in Tilburg and neighborhoud that have received the bulletin are : HCC-Tilburg-1 , MARCOM-BBS, Kangeroo-BBS, The ATTIC, INFOBOARD, and many more….This computerized version of the TAM-Bulletin is also being printed out. In this way I still can inform people who don’t have acces to a computer. Also this communication-way is sometimes still cheaper then the phone-costs for datacommunication. I have to say that this electronic form still in not that effective in the network although the INTERNET is changing that rapidly. 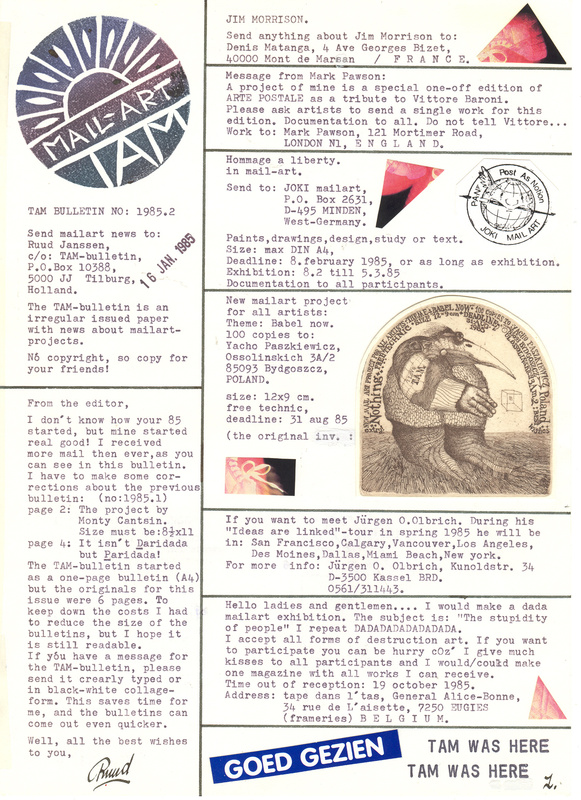 The new TAM-Bulletin. 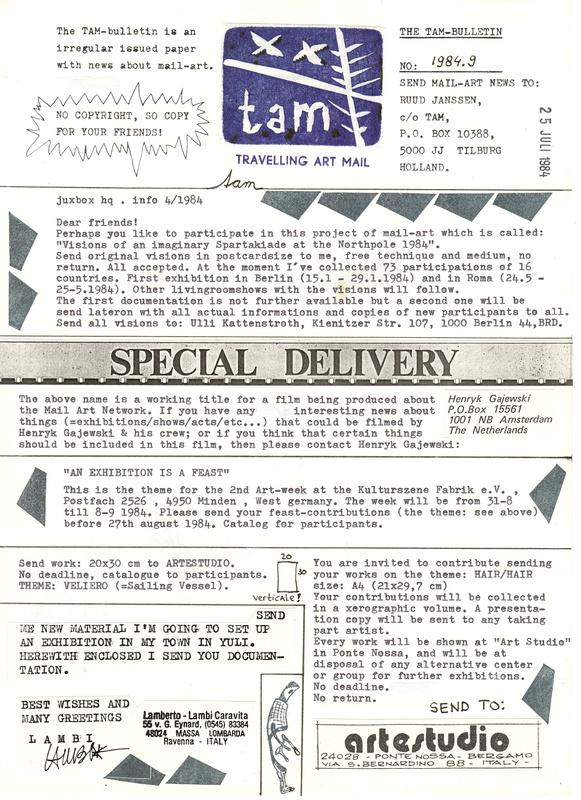 In July 1993 I started with a new form of the TAM-bulletin. 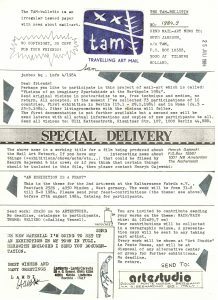 The computer-issue only was uploaded by a few mail-artists , and it isn’t worth the trouble to keep such a thing going. 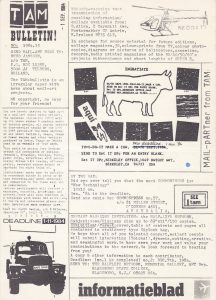 For communication , the FAX-machine is more used by mail-artists then the computer. 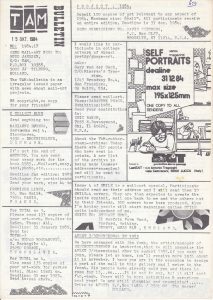 Also in America the magazine ‘Global Mail’ is issued and available by BBS , and I see how the computer-information can get ‘old’ if it isn’t updated correctly. 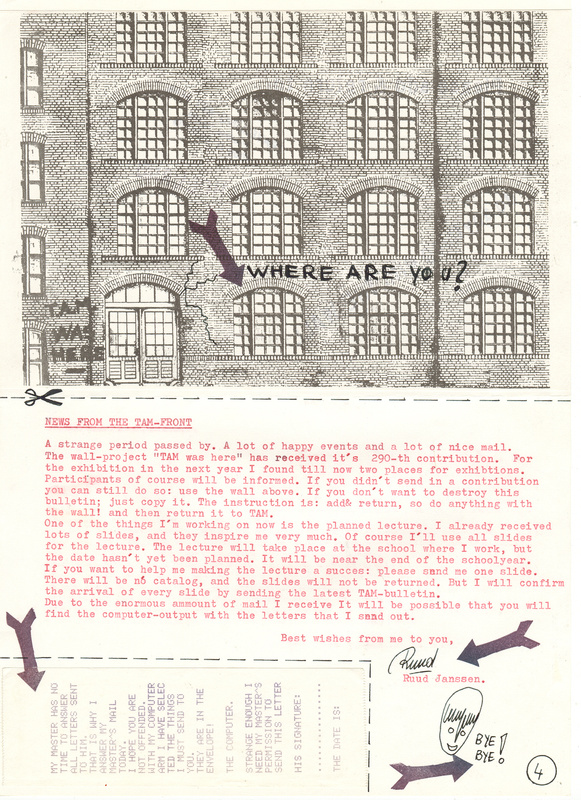 Addresses of people who quit with mail-art and projects with “no deadline” are being published for years. 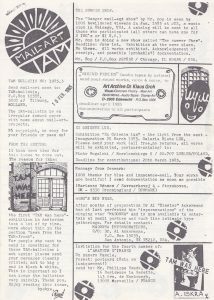 Also the magazine ‘Global Mail’ became too large in my view. 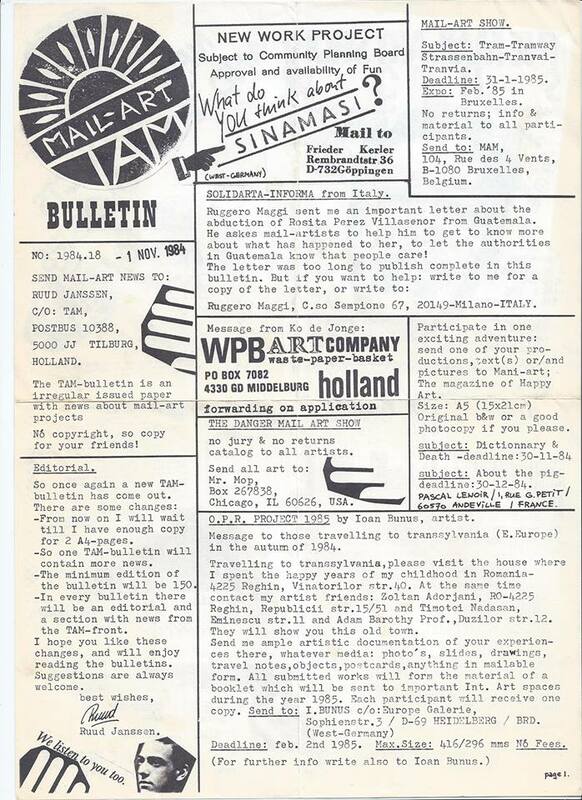 250 listings and more, is just too much for someone who wants to be creative.So the new TAM-bulletin is something completely different. 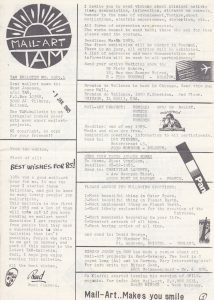 I make every TAM-bulletin as an original , and send it to someone in the mail-art network. 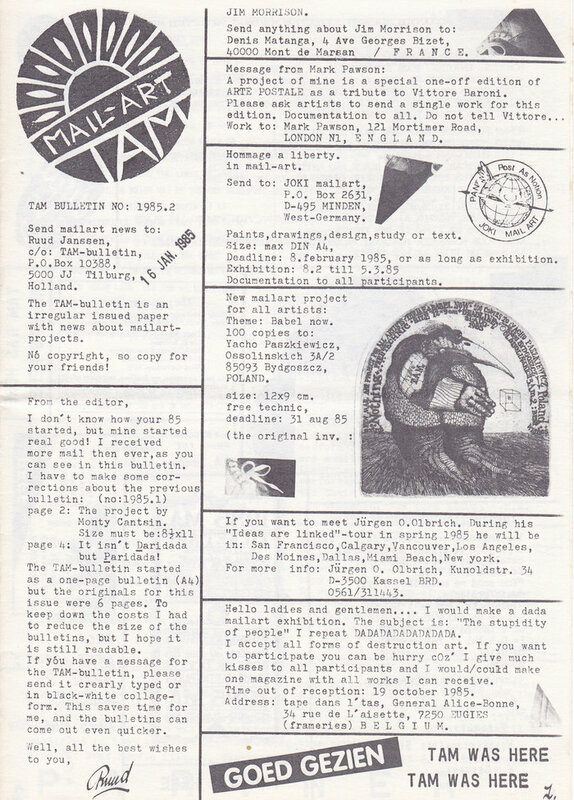 The bulletin mostly contains also some mail-art projects , and the request is to pass on the TAM-bulletin after being finished with it. 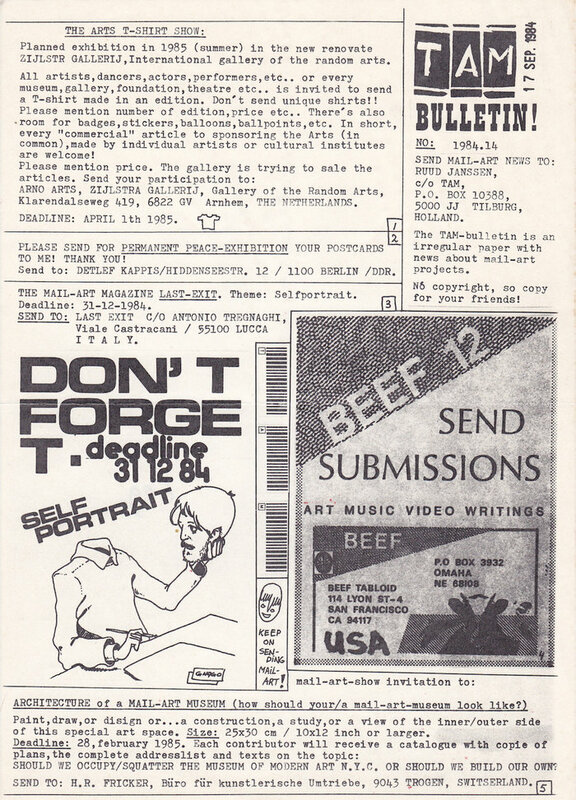 Also mail-artists can add information in the bulletin , and add anything else to it. 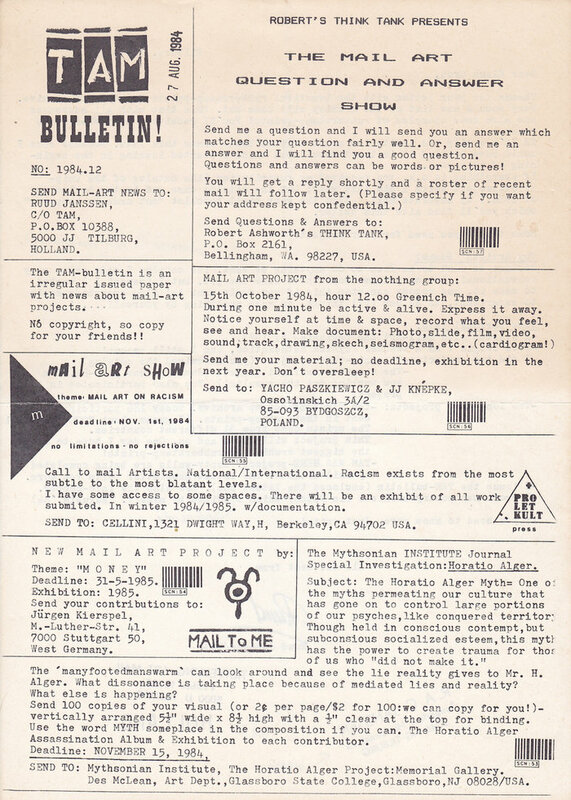 It has become an “add and pass on” booklet , and every bulletin sooner or later will end up in some archive or a dumpjard.At the moment the different forms of the TAM-bulletin exsist beside each other. 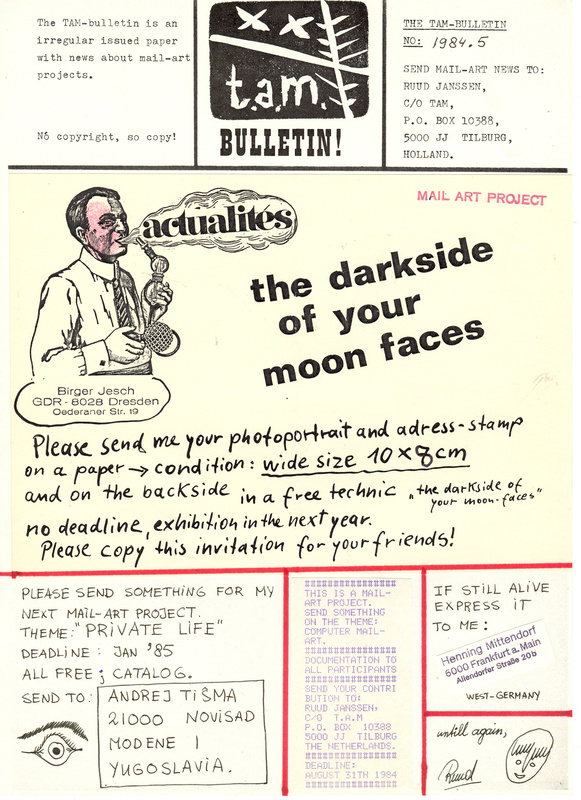 Sometimes I send the ADD TO-version. Sometimes I print-out the computer-version, just how I feel like doing it at a certain moment. Tam-Bulletin on INTERNET. In October 1994 I start with experimenting on the Internet. This was possible thanks to an experiment in Amsterdam with the Digital City of Amsterdam (DDS).At the moment (July 1997) I still use this e-mail address although I have also a local access-point from the College where I work. All info’s I have on my computer I can now send into the electronic network. I did experiment with some digital versions of the TAM-Bulletin, but to keep the info updated, and because there were already many other electronic zines appearing, I decided that the time for real experiments isn’t there for me yet.